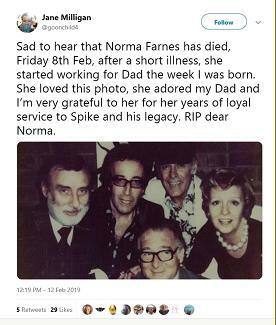 The sad news that the lovely Norma Farnes has passed away means that the Goon Show has lost another great Champion. 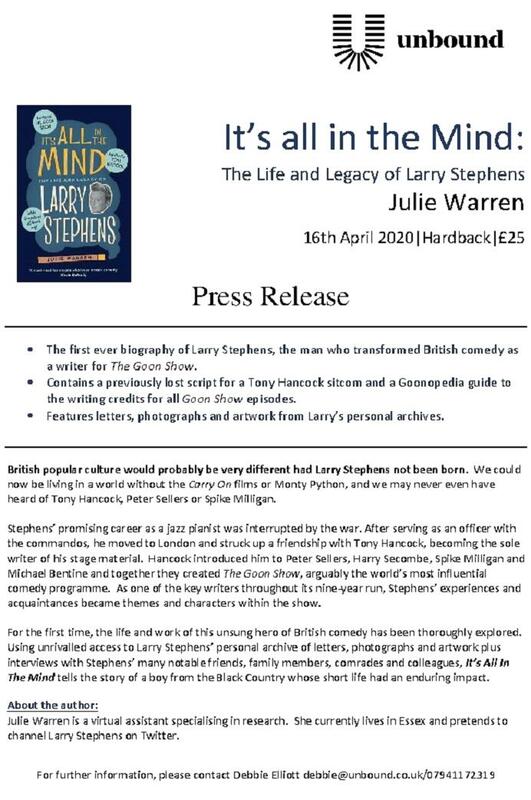 She had been Spike's manager, general coercer, run-around and go-between for almost all of his professional career and since his passing had kept the name of Goonery alive and flourishing through the publishing of new books, memoirs, calendars and all manner of other lovely things, including of course the triumphant UK Tour of The Goon Show with the Apollo Theatre Company. We were lucky in that Norma graced us on many occasions with attendances at our London meetings (for which we have recorded interviews) and she was always up for a group photograph to mark the events. She will be sadly missed by us all. Sad to hear that Norma Farnes has died, Friday 8th Feb, after a short illness, she started working for Dad the week I was born. She loved this photo, she adored my Dad and I'm very grateful to her for her years of loyal service to Spike and his legacy. RIP dear Norma. We send our condolences to the Family at this sad time. Buckingham Palace have announced a Garden Party is to be held in the Palace grounds to celebrate the 70th Birthday of HRH Prince Charles on Tuesday 22nd May 2018 and in honour of the occasion representatives of all His Highnesses Patronages will receive invitations to this special event. Mr John Repsch, Mr Les Drew, Mr Mark Cousins, Miss Tina Hammond and Miss Julie Warren, based on their continuing commitment to the Society and all their efforts to keep the Goon Show legacy alive and kicking. Encyclopedia Goonicus: Fifth Edition now ready. See the EG page for all the details of this masterpiece in Goonery from the extrordinary talents of our very own Neil Trickey.